I need to warn you before going into this post: if you are used to seeing beautifully calligraphed bullet journals, the rustic vibe that exudes from my own will come as a real step down. (Sorry kids.) 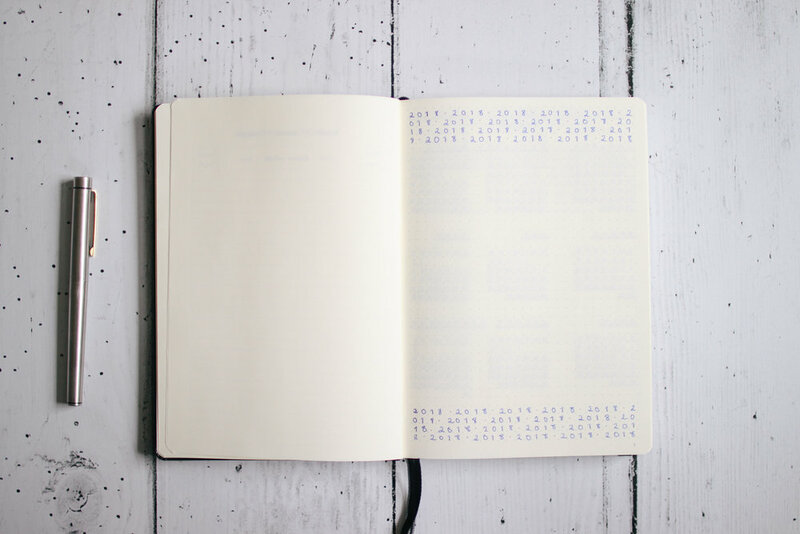 My journal is first and foremost functional; I worried that by going too far down the stylish route, I would end up making it to complex an endeavour to continue and use regularly, so plain and simple it is. I'm entirely new to the world of bullet journalling, so you'll see there are some pages that just didn't work out; I've included them because I want this to be an accurate representation of my journalling experience. Hopefully my mess-ups will spare you some journalling mishaps of your own... Let's dive in. Here's the first of the "I'm not sure why I did this" spreads. Every new diary I've ever owned contains this page and yet I've yet to find any concrete use for it... Since taking this photo I am considering using the leftover space to add some important dates for the year (things like upcoming holidays) which would be a good way to use an otherwise untouched spread. My new year's resolutions have two pages all to their own, in the hope that I can add to this list as the year goes on. There are a few on this list that I've made some progress on, while there are a few others that were more spur-of-the-moment whims (weekly haikus, I'm looking at you). Another spread I won't be repeating is this monthly look at January; it turned out the squares were just too small to fit anything substantial, so I went without for the month. My weekly spreads have proven far more successful; I like how simple they are and that there is more than enough space to mention any significant dates and to tick off anything I would like to get done on any given day... I can't see myself changing these drastically any time soon. 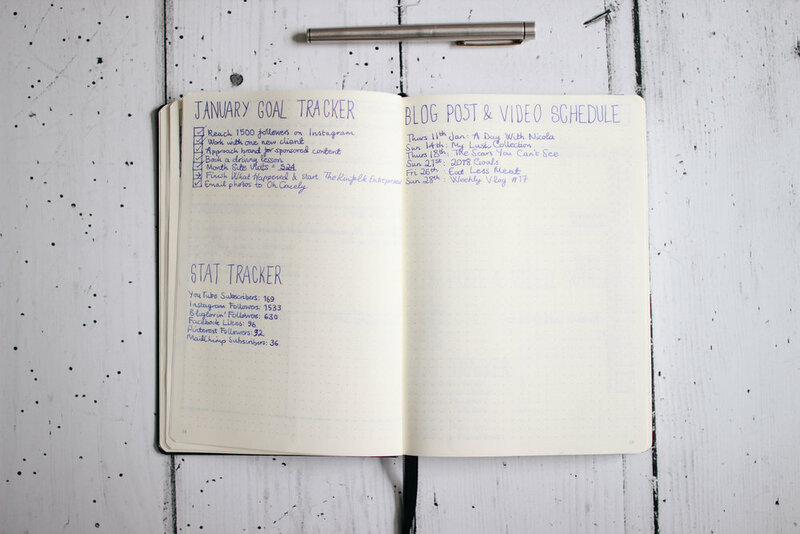 This was one of my favourite ideas for my journal; I've broken down my yearly goals to have monthly steps, which helps me to stay on track with greater ease. It also involves going back at least once in the month to review my year goals, helping them stay a little fresher in my mind. Also included is a little stat tracker to help keep a record of my monthly growth; I have never thought to make note of these before and I'd love to have a year record of exactly how much I've grown online. Last on this spread is my blog post and video schedule; January was a month I managed to come up with content for each of my scheduled spots, which is nice to see! Here's how I updated the month spread for February; this list of the dates was not only quicker and easier to do, but also meant that I had space to quickly note down anything important too. I also condensed my monthly goals & stats onto one page, having realised that I really didn't need a two page spread to record these. This final spread is my latest addition; unfortunately I recently had two seizures and I've decided I need to take note of when they occur. (I'll be talking more about the seizures in a video this Sunday.) 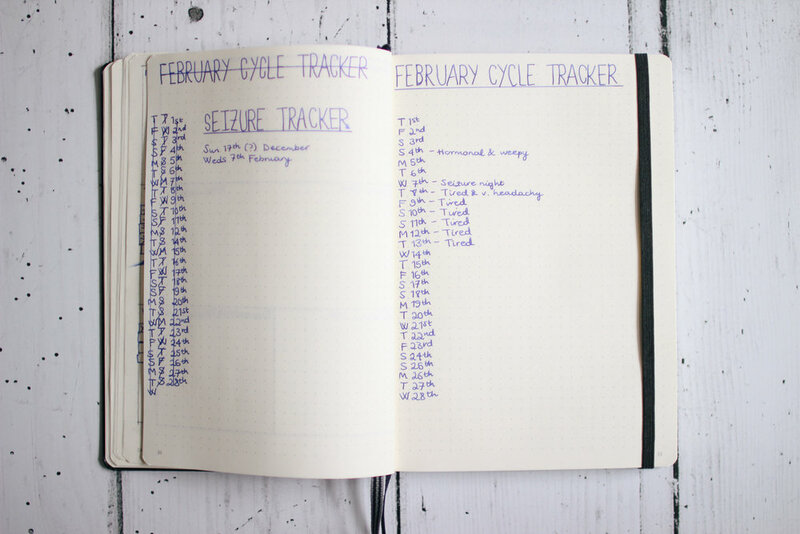 I'm also making note of my moods to track my menstrual cycle; my implant means that I've not had a period in a very long time but I still want to have an idea of what is going on hormone-wise... hence my cycle/mood tracker! Are you guys keen bullet journal users? If you have any spreads that you love and would recommend I would love to hear from you in the comments!